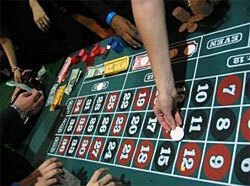 Within land casinos evolution, there has almost never occurred a situation when the player's advantage exceeded the house edge in the long run, as far as roulette, for instance, is concerned. Still, there comes the time, when every roulette player faces an unbearable desire to beat the casino. Then, in addition to some skills, having been gained through practice, and a bit of luck, which is always necessary, he/she starts looking for extra help. Martingale System (also known as the Doubling-up System, or Gamblers Fallacy) presupposes that the player should make even-money bets, and double the previous bet, if loses, until the bet wins. Only in such a case one can reduce the value of his/her bet. The main idea of this strategy lies in the supposition that there will definitely come the moment, when one's bet wins, so that all the lost money returns back. Oscar's Grid System firstly described by Alan Wilson in his book "The Casino's Gambler's Guide" (1965) and became rather popular in the Golden Age of roulette history. The author told a story of a guy, named Oscar, who invented his own winning system, which essence lied in the following: the player starts the game with a 1-chip even-money bet. If he/she wins, he/she starts from the very beginning again. If he/she loses, the next bet has to have the same value, as the previous one. If this bet wins, the next one has to be 1 chip larger, than the previous (winning) one. Further, if one player continues winning, he/she should raise his/her bets, until the whole set of bets will give him/her a profit of 1 chip, or more. The d'Alembert System derives its name from the inventor of "The Law of Equilibrium", Jean Le Rond d'Alembert. Based on the above-mentioned law, which states that the outcomes balance in the long run, this betting system's essence is as follows: the player should raise his/her bet by 1 chip every time, he/she wins, and, relevantly, decrease it in the same way, every time he/she loses. The Labouchere System (The Cancellation System) is named after one of the ministers during Queen Victoria's reign, as he is believed, to win much, when using this betting system. The strategy presupposes the following moves: the player chooses a series of numbers from 1 to a defined number. The total sum of numbers in this series is the amount of chips (all of the same value) he/she's aimed to win. If the bet loses, 2 numbers are reduced from the series, if it wins, then only one number is reduced. The Fibonacci System is developed on the basis of the Fibonacci Sequence (1, 1, 2, 3, 5, 8, 13, 21, 34, 55, 89, 144 â€¦), invented by Italian mathematician Leonardo Pisan. This roulette betting system may be described in a following way: the player starts with a 1-unit even-money bet, and if it wins, the next bet will be the same, as the previous one. If it loses, then the player should write "1" on a piece of paper. The 2nd number of the sequence shows the value of the bet. In the above-described case, the next bet will have a value of 1 unit, for instance. If this bet also loses, the next one will be a 2-unit bet. As soon as the player wins the bet, he/she should cross out 2 last numbers in the sequence. When all the numbers of the sequence are crossed out, the game should be finished. Despite the fact that all the above-described roulette betting systems can make the player win more, there are still no records of the fact that at least one of them works in the long run. That's so as no matter what roulette variations are taken, the house edge will always prevail. Still, trying to use one of these strategies, the player will definitely diversify his gambling experience, so why not to try?